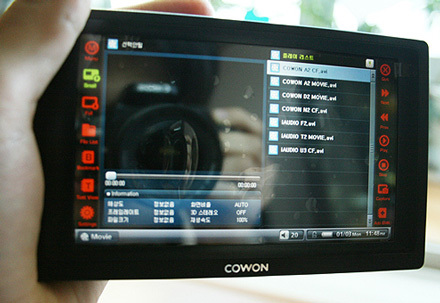 Normally our product unboxing posts are reserved for prime American kit from the likes of the biggest manufacturers, but Cowon's Q5 portable media player with its integrated WiFi and HSDPA definitely deserves the same treatment. Just so you get a sense that the feature packed PMP actually exists and is coming to these shores, check out the product unboxing over at the Cowon forums. Get a load of that 5-inch 800x600 LCD display, check out the included remote and cables, and ogle at all that unintelligible (to us) Korean text. Just to remind you, the Q5 should be dropping sometime this quarter for $499 to $549, depending on whether you opt for the 40GB or 60GB capacity.